There must be a place for solar, buildings need roofs? It's just totally inefficient. Fixed arrays on top of homes and what-have-you are not that efficient. They rarely face directly at the sun so they produce less than nameplate like 99% of the time. If you add in the cost of a DC inverter and battery storage, over 20 years your solar panel system will cost more to maintain and operate than purchased electricity at anything up to about $.18 a KW. That's about a 50% increase over current costs in the US. The only reason people are buying the systems is they are heavily subsidized (30 to 50% in the US depending on state). That means your own costs bring it down to where it's just a bit cheaper than buying electricity. But, without those heavy government subsidies, nobody would buy solar. Except these usually set a few inches above the existing roof and present some maintenance issues. In Winter with snow fall you'll need to sweep them off, in Summer when dust settles on them they need to be washed off. The lifespan of many asphalt shingle roofs aren't quite as long as that claimed for the solar panels, so if repairs and/or replace of roof shingles is needed, you have those panels in the way, to deal with. It gets worse. The newest fad is for companies to lease you the panels. I have several neighbors who did that. One wanted to sell his home. It took several months because more than one buyer walked away when issues with the solar leasing company came up. Another had problems with their panels. The company took nearly a month to send someone to finally fix them. In the meantime, the homeowner couldn't do anything with the solar panels himself because he didn't own them. Or, get a good storm like a hailstorm and have them wrecked. Watch how much your homeowner's insurance jumps by when they get replaced. Solana, the biggest commercial solar array in Arizona has had multiple fines (the biggest being $1.5 million) for excess pollution by ADEQ (Arizona's equivalent of the EPA). A couple of years ago it got hit by a microburst storm. Took the plant off-line for weeks and wrecked like about a third of it. The repairs to return to full service took about six months. Look at California... They are having regular brownouts now due to the massive increase in "Green" energy there. They also are paying one of the highest rates per KW in the US. Better, because of the massive fluctuations in solar output, companies in California have had to PAY companies in Arizona and Nevada to take the excess lowering rates in those neighboring states! The joys of a "liberal arts" education. I remember my college days where I took astronomy as an elective because I thought it was an easy A for an elective course. The class was full of liberal arts and fine arts majors who were in near apoplexy over what they thought was a "hard" course because you had to do math and science. I was floored-- astounded by their illiteracy of both subjects. Worst, once the prof realized I was taking it as an elective and expected it to be easy, he made me a defacto TA and told me I'd get an A but only if I helped the other students through the course. <snip> ... In Winter with snow fall you'll need to sweep them off, in Summer when dust settles on them they need to be washed off. The lifespan of many asphalt shingle roofs aren't quite as long as that claimed for the solar panels, so if repairs and/or replace of roof shingles is needed, you have those panels in the way, to deal with. I guess that's one practical disadvantage not applicable to my part of the World. NO snow in winter, lots of sunshine most of the year and - being somewhat closer to the equator - slightly stronger rays. Only thing is, I haven't bothered installing any solar panels yet. Good for you. Solar panels, even if you get them wholesale and install them yourself, are simply paying for 20 years of electricity now rather than on an installment plan. You really save nothing. Solar is so inefficient it hurts. My guess is that in climates and latitudes such as mine, solar would work a bit better than in more temperate/cooler zones but it's still a darned big expense up front. I suppose if I was gonna do it, I should have done it 20+ years ago but we were scraping for a $ back then. We've got the $ now but there's not much point anymore. Regardless, I'm not convinced I could have made much difference to global warming either way. Predictions are that solar cost could drop as low as (what's your guess) kw/h? In recent years, I've noticed that a good number of new houses being built in my area have solar panels included as part of the initial build. My guess is in some cases at least, these might be part of a "package deal" (effectively at a lower price than if folks had the panels added later). If the cost of solar panels drops substantially, I could foresee this becoming much more common; perhaps even standard practice, in some localities. My guess is that if the panels were free you'd still lose money over natural gas or nuclear. That's how poor solar does commercially. Even home systems are that bad economically. Better to spend less cash for more effect on insulation and making your house as air-tight as possible. For example, go buy a few tubes of urethane caulk (silicon will work too) and do every electrical outlet (switch and receptacle along with any ceiling light octagon boxes), so that there is no gap around the outside of them to the drywall. You can further put a dash of foam spray insulation on each Romex cable entry to the box. That air seals these to prevent cold or hot air from entering the house. Make sure all doors and windows have good tight seals with no air gaps. 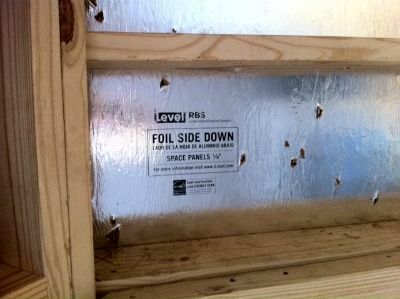 Another good one in warmer climates is to add foil backing to the roof sheathing, and even the walls if you are doing new construction. This alone on roof sheathing / underlay will drop the temperature in the attic 10 to 30 degrees and make a major dent in your electric / air conditioning bill. I've done all that, and a bit more, on my house. With a pool and a 4 ton AC (14 seer) unit my monthly electric bill (all electric house) is about $175 for a 2200 sq ft home. The electrical utility has come out twice trying to see if solar would benefit me, and even their generous calculations show I'd lose on the deal. All that upgrading cost less than $1000. I also did double pane windows (paying only for the windows which I did the install on). Bottom line-- Solar is an expensive bust until you have exhausted all the cheap fixes to lower your energy costs, and even then is likely to be a major fail. All the money that went to solar and wind should have gone to developing thorium molten salt reactors in my opinion. That doesn't mean solar and storage do not have a place for residential. The goal should be for people to use more energy not less and solar and storage has a place. The real savings from solar have to do with distribution costs. That is why forcing utilities to buy solar from homeowners is so backwards. Solar to offset the demand from electric cars makes sense in some areas. Solar could also replace the need for backup generators. The cost just needs to get down to $0.10 per kw/h. The influence of Marx on the left's thinking is truly unfortunate. Marx's rather unsophisticated collectivist views lead to a preference for conservation, mass transit, and inefficient renewables instead of higher tech. The environmental movement in particular is polluted with a misanthropic and dystopian ideology. It is a result of the collectivist rejection of individual sovereignty and values and replacing those with a superficial identity of class. I, ROBOT cars for example is the future if individual freedom is not hijacked by brains damaged by our socialist orientated universities where mass identities are promoted along with mass transit.